I haven't posted for some time. I do think many posters on here are being a little unfair to the manager. We have a chance of a cup which, as has been said, is our first honour for 10 years. As for saying it is a tin pot trophy, that is rubbish. It is the third best cup competition we can enter. I do not think we are going to win the FA Trophy any time soon and the FA Cup will not be in our cabinet in my lifetime so the league cup is the best that is attainable. Far better than the Middlesex Senior or the Middlesex Charity Cup. To reach the final we have had to win 5 matches. Not draw but win, even on penalties, and if we lift the trophy next week the lads can feel proud as can the club. As for the manager. I do not think he is the best manager we have ever had but he is in the best 7 we have ever had and I would put him in the top 3 of that number. I do find his tactics negative and lacking charm but there is a tactic that I can recognise and if Faal had remained fit I think we would have been in the promotion mix. As it is I don't think that he has a good eye for a forward and I don't think that he uses the players in their best positions. I believe that he needs a good coach next to him who might persuade him to be a little more adventurous and I also think that he should try to blood in some younger players. The players we have do not seem to have the speed of the teams that we play against which makes us ponderous in our build up after the first 15 or so minutes. As it is we win the cup on Wednesday and have a good end of season accumulating 12 points out of the last 15 to finish with a shout of the play-offs if not amongst them then I will be satisfied. It seems to me we are still a work in progress and the manager must be given a chance. I don't see a plethora of managers of equal or better ability lining up to take charge. I have always respected your views Steph1 and do not intend to change now. Although I still have a couple of queries. Firstly, I was under the impression that we received a trophy when gaining promotion. Or am I imagining that we did? I am sure someone can put me right. Even if I am wrong then gaining promotion to the current league was a great achievement. Secondly, from my understanding this manager has been given a much larger budget than any of the previous ones. However it is not necessarily the money that has given rise to the current disillusionment of many supporters. Nor is the quality of players he has acquired but the perception of his inability to gel them into a team. I said several weeks ago if has the ability to solve this problem we still have an outside chance of scrapping into the play-offs. As a consequence of the terrible injury to Blackman he will be forced t o make a changes. So let us see happens. This week may be our last chance to make a start especially as Kingstonian are on a run of five consecutive loses. I would be untruthful, however, if I said I would be happy for him to carry on. You would be surprised the number of young well qualified managers out there. However, you need someone within who has the knowledge to spot the right one to suit our club. When we played Chesham in the cup a few seasons back he used the same tactics and they worked then. But Theo is right his tactics are negative and lack charm and he has never seemed to change them. The formation may change but it is still the same old get forward to the last third then bung it over to Britnell. Occasionally you see Britnell out wide as he tries to get involved or loose his marker but when that happens we generally end up with a shot from edge of the area or just outside blocked by the mass of players in defence in front. Britnell is no winger or even an inside forward he is a target man who cannot win the ball in the air so needs a good foil to work off him. As I inferred above Faal was the perfect partner. I am sorry but your analogy suggests that coming second has no merit. I have to admit as a player that I was never happy when I was on the losing side and I am still never happy when the club I support loses. 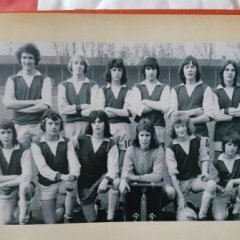 However, I have been to all the Wembley Finals that an Enfield team have been involved in ( including replays) and even when they lost (came second) I was proud of the clubs achievement. But having been a spectator for over 50yrs and have formulated an opinion from what I have seen. I now judge managers between those with good or poor player management. As a result I have come to my own opinion that AL lacks the kind of management which this club and supporters need. As I have said a a personal opinion and is open to discussion. Regarding the game at Cheshum I agree he had a team team for the condition of the ground,with its quite severe slope and undulations. Long forward passes and fast runners. Unfortunately on a flat pitch he has adopted the same style without the fast forward runners. Interesting to see that Margate's new manager has received the Manager of the Month Award. Installed in Feb followed by 7 wins and 2 Draws. This compares with our 3Ws 2Ds and 4 Ls. What a difference those 4 wins extra wins would have made for us. We would be in a comfortable 3rd place. Just a thought for those who say that nothing can be gained by changing a manager during the season. Slightly amusing Andy but I didn't understand it at first as I couldn't recognise the language it was written in. Fortunately my dog translate it to me.🐕 He's used to looking at whats on walls. Beer prices will go up irrespective of what happens with the team and the number of supporters coming through the gate. Well then nothing for us to worry about. Have a good night. As for humour I'm more " Hancock".